The four urns on the sunroom ledge were left over from our oldest daughter's wedding ten years ago. It's always a challenge what to put in them that is maintenance free. At Christmas, I put poinsettias in them for a seasonal change. Then I remembered the succulent rings left over from our youngest daughter's wedding this last December. I put a small plate over the top of the urn to hold the ring, then added a flameless candle, also left over from the wedding. The candles are from Costco and are the coolest flameless candles ever. They actually are on a timer, so every night at dusk they turn on. I'm not really into flameless candles but they were perfect for the wedding. The candles are quite realistic. They're real wax, scented with vanilla and actually flicker too! By combining the leftovers from both daughter's weddings, I think I've finally come up with a maintenance free, beautiful solution for the sunroom ledge. Beautiful. I was just thinking about getting 2 urns either for my dining room or for my front door. Just like you I was wondering what I would put in them once I got them. In the dining room I have no natural light and in the foyer and the rest of the house I have a lab puppy who would love to eat whatever. Maybe I should buy bases for them to stand. Delores, what a lovely solution for your urns! I adore succulents...very low maintenance. The rings and candles, combined, are just gorgeous! Great look for the urns. It's nice that you could reuse the succulents and candles from the wedding. I received the Costco candles as a gift, and they're really great with the timer. 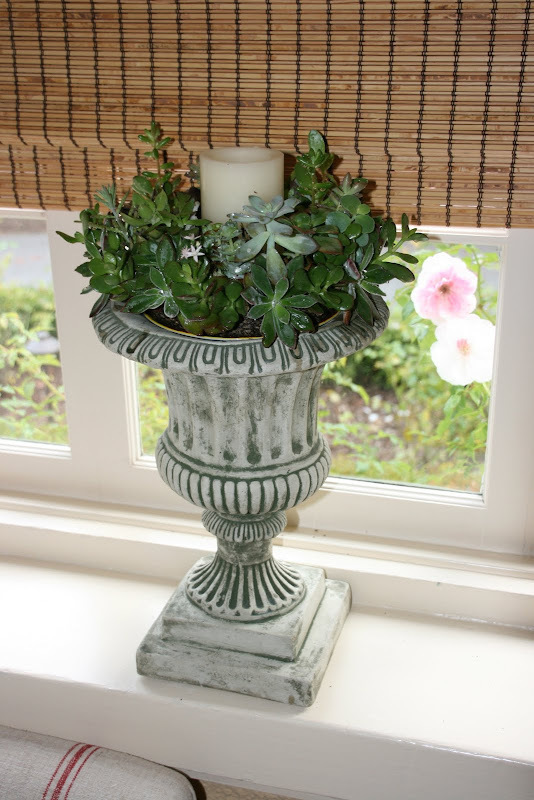 Love your wide window sills so perfect for your beautiful urns. It is special to incorporate things from both daughter's weddings is such a beautiful way. I love urns! LOVE the change Delores! They looked beautiful all three ways! Great repurposing Delores, and all of the looks are lovely! Like what you did with the urns. I have a couple that I need to redo and you gave me an idea. Love, love, love! You probably already posted about it, but did you make the succulent rings? I like them much better than the moss balls. Very classic. I think each solution you have used works very well...I do love the look of the succulent ring with the candles. Love the fact that you have wonderful decorating pieces that will always remind you of both your daughter's memorable day. Truly priceless. The succulents look so fresh Delores, and the candles look far better than when I saw them in Costco! You might have converted me (and they are far safer than real candles next to your matchstick blinds, doesn't bear thinking about). I love those succulent rings! The really look great. Aren't the candles great-- I purchased the same at Costco last month. They are on the dining room table in the center of the house and are really romantic. I think the auto timers are the best invention ever, and I thought I'd not like them! Never say never! I agree Simone! I never thought I would like a fake candle, but....I purchased them for the wedding to sit along the window ledge of the venue. I have 24 of these things. They're now everywhere in my house. On the mantels, tables, etc. I even marched them up the stairs. At 6:00, they come on for 5 hours. So cool! I've purchased several sets of those Costco flameless candles - they're great. 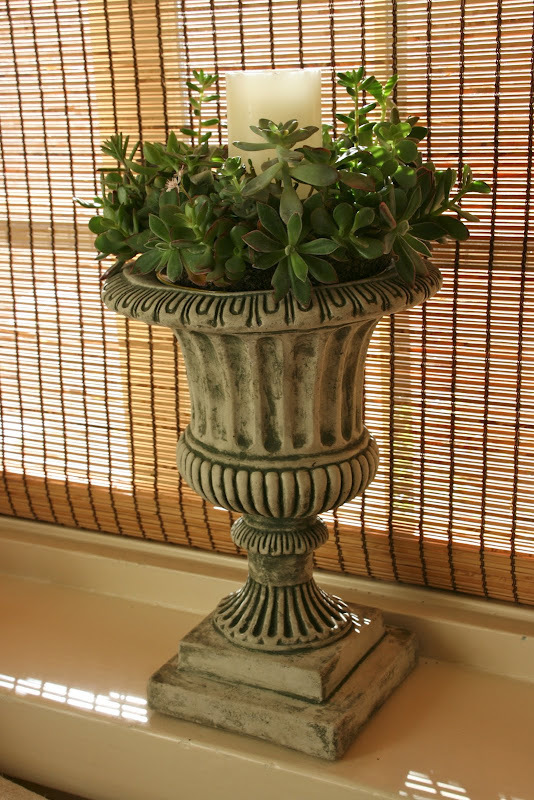 I love the various looks of your urns - the succulents are stunning! The urns look great and I think that the flameless candles are a great idea. Just beautiful...you certainly have the magic touch and everything you have done in those urns, I love! I love the flameless candles because I am so afraid of setting something on fire. Will have to check these out at Costco. I love the look of real flame candles too, but such a fire hazard. Love it! I have those Costco "candles" as well and love them. I also have the ones they sold that are on a remote and those are great but the batteries run out pretty quickly. Now I need more urns! They look so lovely - in ALL those images. I'm not sure which is my favourite - maybe the candles. Your blog is so lovely - I really thought I was already following you but Google seems to have other ideas. Anyway, I have now subscribed again!! What a great idea for the urns. I love the succulent rings and faux candles. A friend of mine told me about the timers on the Costco flame-less candles...I have to get some for those areas of the house where a real candle is impractical (bookcase, lantern). Very pretty. 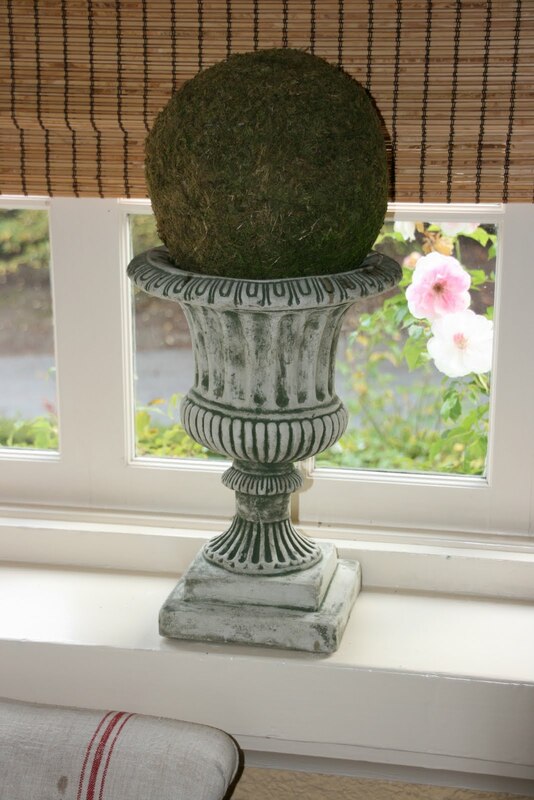 I love the urns and what a great idea to use on the ledge of your sunroom. You can change those depending on the season! Beautiful! I have some of those Costco candles. I love the way you used them. These look great and how wonderful to reuse what you already had. I love the look, Delores. I bought some of those flameless candles this Christmas to use among the fir branches on my console. It was safe and attractive, and with the scent of vanilla, it seemed realistic. Great tip about the costco candles. Mine are from Pottery Barn and not scented...I do love the timer option...since they are not convenient (high up) to light. Still...I love a pretty scented real candle (got some half price at Mitchell Gold two days ago).